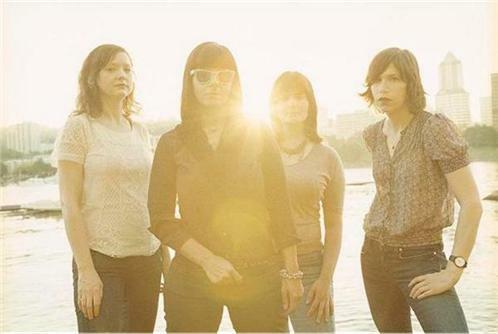 Wild Flag is a Portland, Oregon- and Washington, DC-based quartet consisting of Carrie Brownstein, Rebecca Cole, Mary Timony, and Janet Weiss. The members of Wild Flag have played in numerous and notable bands including Sleater-Kinney, Helium, Quasi, The Minders, Stephen Malkmus and the Jicks, and others. The four musicians who make up Wild Flag have known one another for well over a decade. Brownstein and Weiss were in Sleater-Kinney and toured with Timony's band Helium on numerous occasions. Brownstein and Timony played in a side project called The Spells. Rebecca Cole's Portland-based band The Minders was a frequent opener for Sleater-Kinney. Weiss and Cole play together in the 1960's garage-rock cover band The Shadow Mortons. If someone drew a visual representation illustrating the ways in which all indie bands are interconnected, Brownstein, Cole, Timony, and Weiss would be in the same tiny sphere, so playing together felt almost inevitable. After collaborating on a score for a documentary, the ease with which they worked together proved infectious and promising. Future practices were scheduled, songs were written, Wild Flag was formed. Yet even after the members of Wild Flag became intentional about playing together-and Mary was flying from DC to practice in Portland-the band was hesitant about naming this endeavor. Yes, they knew how to be in bands, but not in this band. Wild Flag wanted to figure out dynamics, hear how the songs breathed in a live context, build cohesion and unity, and emerge as a singular force prior to putting those sounds onto tape. Wild Flag always intended to grow organically, never wanting to take for granted that an audience existed based on previous endeavors. So, instead of recording an album and then playing shows, they went on various tours, playing tiny club shows in the US and building up a fervent audience of their own. In April of 2011, they went to Sacramento, California, where they recorded their self-titled album with engineer Chris Woodhouse at the Hangar. All tracks were recorded live except for the vocals.